Last weekend I decided to try a new off-road trail in my 1971 Land Cruiser. I noticed an intriguing route on the map that starts just west of Cisco Grove at an OHV (off highway vehicle) staging area called Indian Springs. 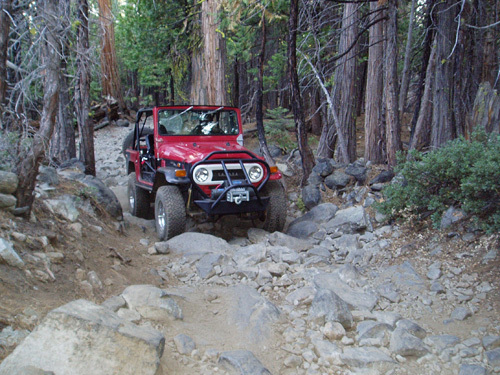 The route is called the Fordyce Creek Jeep trail and travels northeast into the central part of Jackson Meadows. The route looked especially enticing because it goes into the spectacular terrain that most people notice to the north of I-80 just after Emigrant Gap when traveling eastbound toward Truckee. I had traveled several trails labeled “high clearance” and “OHV” on my map, but this was my first attempt at a trail designated as “4 wheel drive” on the map key. My Toyota Land Cruiser FJ40 has 4-wheel drive “low” gearing combined with 32-inch tires, 4 inches of lift and a winch rated for 9000 pounds so I figured I would be fine. My friend Jason was up for the mission, which was great as it’s always reassuring to have a wingman and second brain on board for backcountry adventures like this. Also on board the vehicle was a spare tire, tools and extra gas. We started our journey at 5 am to avoid exposing the engine to midday heat. The Fordyce trail began by meandering through dense forest. After a short ride the trail started to climb and featured many cobblestoney sections with small and medium sized rocks that were a blast to navigate. A bit further along, we encountered some angled rock slabs that provided awesome traction for the FJ. Although we were fully enjoying the experience we started to notice that the technical features intensified as we progressed. Before long either Jason or I had to walk in front of the vehicle to verbally navigate the driver through hazardous sections. Eventually we came to a section that involved stacking rocks to create a ramp over some rather large boulders that we were unable to clear on the first attempt. We pressed onward and upward getting slightly nervous and keeping an eye out for potential turnarounds should we need to abort the mission. The next obstacle we encountered was a 4-foot high vertical slab with a huge boulder on the left side. I shouted to Jason “this could be the end of the line.” He had driven most of the technical sections so far and stepped out of the FJ for a look at the problem. We assessed that it would involve a winch or cause vehicle damage or both. We then walked ahead to see what the next challenges would be. The next couple hundred yards featured three difficult sections and no space to turnaround. I was hoping Jason would opt to pull the plug and he did. Even though we had a winch the prospect of getting in a predicament where we would need to back down a long technical section did not fare well with either of us. We also figured we would begin seeing other jeeps start to head up the trail and we were blocking the road. We backed up about 50 yards and turned around. No sooner had we begun our descent than we heard and saw the first round of vehicles heading up the Fordyce Jeep Trail. The first three rigs were fully loaded Jeep Rubicons followed by an early 80’s FJ 40 Land Cruiser. All of them had huge tires, beefy suspension systems, and undercarriage skid plates. We pulled over to let them by and chatted with an older gent who got out of his Jeep to wait for one of his buddies. We explained that we had turned around having bit off more than we could chew. He offered to let us join their posse if we wished to give it another shot but we declined knowing our Cruiser was not worthy in its current state. He then replied “yeah I’m pretty well setup. I’ve got 35-inch tires and E lockers,” referring to locking differentials allowing for additional traction when stuck. The next vehicles we passed were even more impressive. 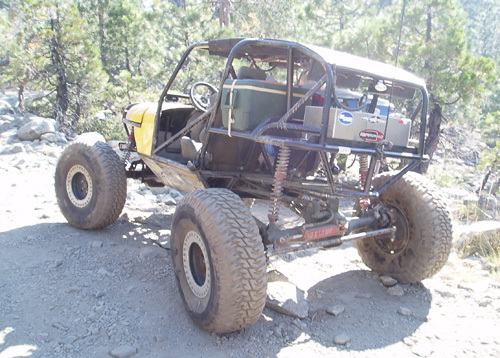 Most were full bore “rock crawlers” with massive tires, custom fabricated roll cages, and huge lift systems. One buggy even skirted out of our way laterally with four wheel steering. All of the rigs had gas cans, coolers and camping supplies firmly tied down to prevent items from going overboard during rugged travel conditions. Finally we arrived back at the OHV staging area to find about 30 full size trucks with flatbed trailers and their occupants in the process of unloading the sickest arsenal of off-road vehicles we’d ever seen. By now we realized this trail certainly must have some kind of reputation in the 4-wheel drive community. As we chugged up Old Highway 40 back to Truckee Jason suggested we Google the Fordyce when we got home. What we found online made us very glad we turned around when we did. 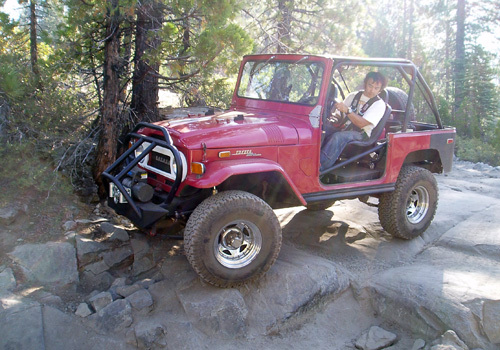 Many jeepers consider the Fordyce Jeep trail to be more challenging than the infamous Rubicon McKinney Trail on the west side of Lake Tahoe. It features three “deep water” river crossings where people suggest at least 35-inch tires even when it’s running at its lowest. The Fordyce also has five technical “winch hill” sections that, as the name suggests, require a winch or a highly modified jeep to navigate. Many guides recommend you only try the trail with a lifted and locked vehicle with skid plates and large diameter tires to minimize body damage and maintenance to your rig on the trail. Other stories warn of “hydrolock” during water crossings where water gets in the engine and stalls the vehicle. We also came across hairball YouTube footage of people winching their completely submerged trucks across the river. It’s easy to see why jeepers travel in numbers to help each other out. In all we had a great adventure on the Fordyce Jeep Trail. Although humbled by the technical aspects we felt fortunate to get away with no real damage to the cruiser. Maybe we will give it another shot someday once I have made some improvements. In the meantime its nice to know there are people out there who voraciously accept the challenge of the Fordyce Creek Jeep Trail.